If you wanted to sample the enormous amount of preparation involved in the staging of a major event like the Yukon Quest, then last Saturday, Jan.22, at Summit Logistics in Fairbanks (and in Whitehorse at the White Pass & Yukon Route Depot) would have been the place to be. It was the Food Drop day, when Yukon Quest mushers bring their race supplies and necessary equipment – including all the dog food needed for the trail – to the two Food Drop locations. By providing this food distribution service to the mushers every year, race officials ensure a smooth race. The rules state that all food and equipment shipped to checkpoints for the race must be in cloth burlap or woven poly-bags, permanently marked with the musher’s name and checkpoint to where it’s destined, with a gross weight of each bag not to exceed 40 pounds(18.1 kg.) There are several bags for each checkpoint and there are ten checkpoints in total. Mushers figure to have about a ton of food and supplies – around fifty bags – on the trail for their use. From this point, a small army of volunteers under the supervision of the Race Manager takes over as the bags are sorted and put on pallets for shipping. The supplies from Alaska-based mushers destined for Yukon checkpoints will be shipped to Whitehorse, while all bags from Yukon-based mushers destined for Alaska checkpoints will be transported to Fairbanks. Bags are then distributed to the ten checkpoints, themselves, before the first dog team takes off on Saturday, February 5th. Once the race starts, no food or equipment can be delivered, with the exception of Dawson City. Mushers are not allowed any additional items, unless they secure them from a generally available source, like a store. The philosophy behind this rule is that mushers should be independently able to care for their dogs, themselves and also have the ability to offer emergency assistance to another musher in need. 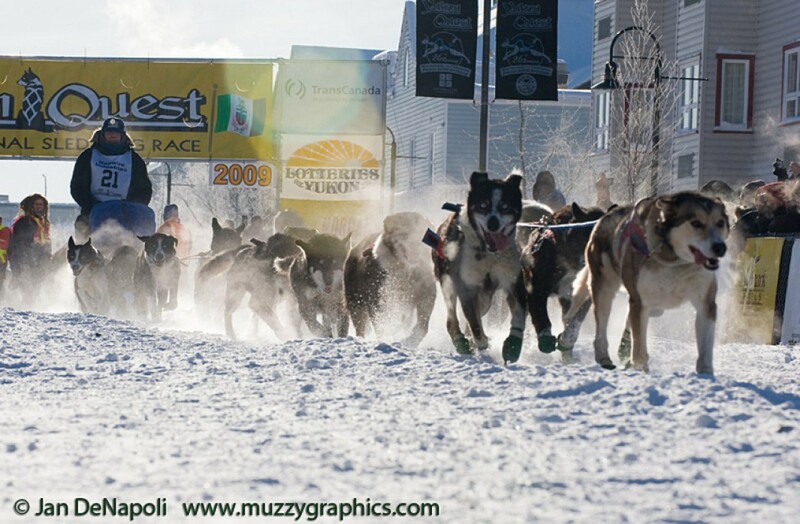 By now, the mushers have invested many long and trying hours planning and preparing for this race. Veterans racers, like Dave, have a good idea of what to expect logistically, while rookies breath a little easier knowing another deadline has been met and food, at least, will not be a worry. By way of celebration, after the hard work was done, Yukon Quest International held a Purse Party at the Musher’s Hall. Hobo Jim sang songs long into the night and a grand time was had by all, but the scent of anticipation was in the air. Mushers know the real celebrating won’t start until after the race has been run. See you at the starting line and thanks to all the Food Drop Volunteers for their help this past weekend! !